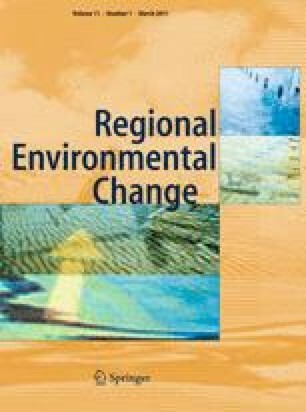 This paper reviews scientific and gray literature addressing climate change vulnerability and adaptation in the Inuvialuit Settlement Region (ISR) in the western Canadian Arctic. The review is structured using a vulnerability framework, and 420 documents related directly or indirectly to climate change are analyzed to provide insights on the current state of knowledge on climate change vulnerability in the ISR as a basis for supporting future research and long-term adaptation planning in the region. The literature documents evidence of climate change in the ISR which is compromising food security and health status, limiting transportation access and travel routes to hunting grounds, and damaging municipal infrastructure. Adaptations are being employed to manage changing conditions; however, many of the adaptations being undertaken are short term, ad-hoc, and reactive in nature. Limited long-term strategic planning for climate change is being undertaken. Current climate change risks are expected to continue in the future with further implications for communities but less is known about the adaptive capacity of communities. This review identifies the importance of targeted vulnerability research that works closely with community members and decision makers to understand the interactions between current and projected climate change and the factors which condition vulnerability and influence adaptation. Research gaps are identified, and recommendations for advancing adaptation planning are outlined. This research was funded by the Department of Indian and Northern Affairs Canada Climate Change Impacts and Adaptations Program and benefited from in-kind support from the Nasivvik Centre for Inuit Health and Changing Environments, and the International Polar Year Community Adaptation and Vulnerability in Arctic Regions (CAVIAR) project. This research was also supported by ArcticNet (Project—Adaptation in a changing Arctic: ecosystem services, communities and policy), Northern Scientific Training Program (NSTP), Association of Canadian Universities for Northern Studies (ACUNS) Canadian Polar Commission Scholarship, the Social Sciences and Humanities Research Council of Canada Vanier Doctoral Scholarship, Aurora Research Institute Research Assistantship Program, and the University of Guelph Deans Graduate Scholarship. Thank you to Marie Puddister for Fig. 1. The knowledge shared by residents of the ISR and the assistance of Michael Westlake, Erica Beasley, Adam Kudlak, Harold Wright, Mel Pretty, Hamlet of Ulukhaktok, Ulukhaktok Hunters and Trappers Committee, Ulukhaktok Community Corporation, Auora College (Ulukhaktok), Aurora Research Institute (Inuvik), and the Global Environmental Change Group at the University of Guelph is gratefully acknowledged.